Today I got a free set of earphones. On Sunday I could have gotten a bottle of Coke (they didn’t have Diet on offer). A few months ago I got a free shoe shine. What did I do to warrant all this loot? I downloaded an App. 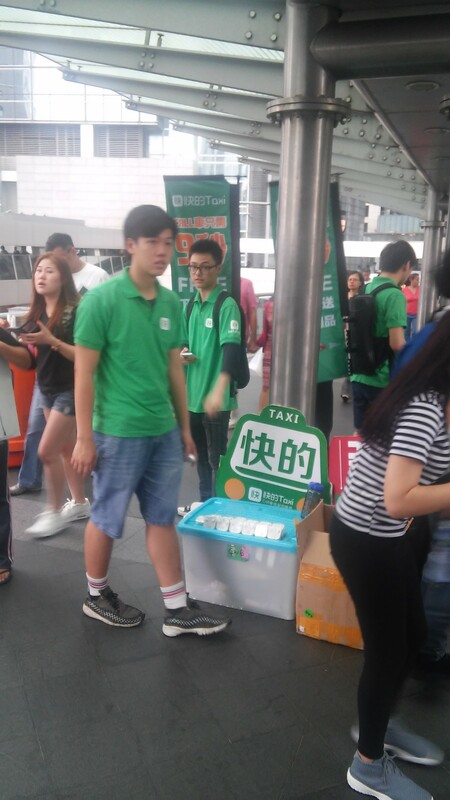 Today in Central a fleet of young men and women were deployed to promote a taxi hailing application. Available on iPhone and Android, the service connects us in Hong Kong with licensed taxis. These iconic red and green taxis cross-cross the nation in an efficient, low-cost way. They’re reliable and almost always sparking clean. I had to download the App, sign in, get a verification code then I got the earphones. Thankfully one of their salesmen was nearby. The App is only available in Chinese. It was the same with the travel app (Coca-Cola) and the business magazine app (shoe shine). They were only available in Chinese. After downloading the app and getting the gift, I was advised by the business magazine salesman to just delete the app. No doubt I’ve since scuffed the shoes as well. Quota-driven sales is all about getting people to download the app – and getting that much closer to your sales goal. It should matter that an English-speaker won’t be able to use a Chinese language site (there is no English language option on these apps). I’d like to think these companies and their sales forces would learn better. But I suppose they don’t know how to spot an earphone-hungry, Coca-Cola-taking, Shoe-shine-needing expat when they’;re right in front of their noses. Maybe they can learn. Is there an app for that? ← Macau: Where have all the gamblers gone?